Come and join in with our fun this Easter holiday – it’s set to be Egg-cellent! In addition to the Museum extending its opening times from 10am – 3pm we will be hosting a series of craft activities in the museum foyer. Come along and try your hand at making a woolly chick, a selection of pretty bunny and extravagant egg cards. All children’s activities are free with museum entry or subject to a small donation. Easter fun is running at the museum from Saturday 13th – Saturday 27th April. Learn the art of Cyanotype printing, a photographic blue print onto fabric using foliage, lace, stencils and objects such as beads and buttons. Prepare your fabric and work through the process to develop individual pieces of cloth. Enjoy a day of hand stitching and reminiscing. Incorporate well-loved memories into an amazing unique heirloom of you handiwork from re-cycled fabrics. Materials provided although you may like to bring your own. Jenni Stuart Anderson, rag rug artist will introduce you to this traditional technique for making beautiful rugs, wall hangings and seat mats. Get a behind the scenes view of the Museum of Carpet. Find out how we look after the collection and discover some of the gems that are not on permanent display. Using Ply-Split Braiding methods you will make small 3-dimesional pieces inspired by natural forms – Flowers, leaves and seed heads etc. For those who would like to develop their skills in braiding. Enjoy a day of hand stitching and reminiscing. Incorporate well-loved memories into an amazing unique heirloom of your handiwork from re-cycled fabrics. Weaving artist Jan Bowman breaks the boundaries of weaving by creating woven spatial divides, panels and sculptural pieces. Her work embraces a high level of craftsmanship and aims to challenge the conventional limits of the discipline. Jan will talk about her inspiration and explain her techniques. Tea and cake served at 3pm. Free entry to the museum and Woven Forms exhibition included in ticket. A wonderful opportunity to learn how to weave with Jan Bowman. 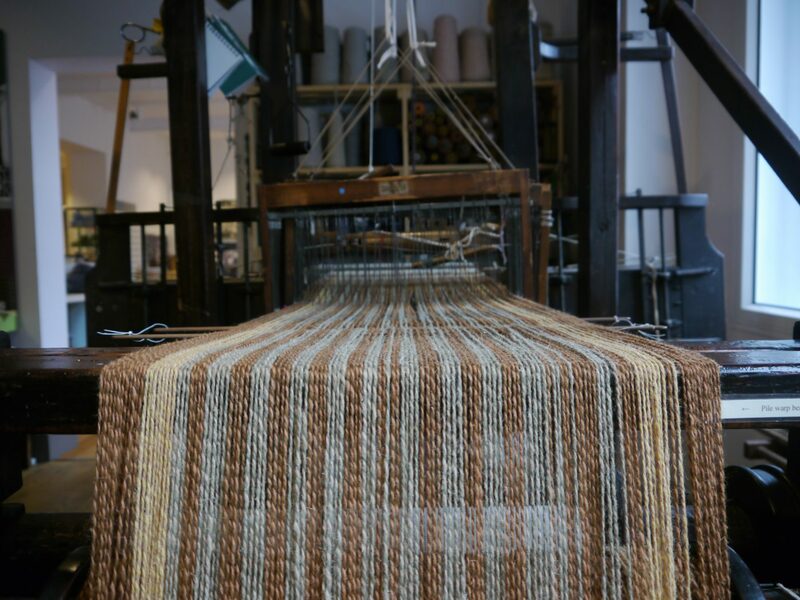 Working on table top looms you will have the opportunity to create your own individual piece of weaving, gaining from Jan’s expert advice and inspirational practice. All materials and equipment provided. Vanessa Stone, paper cut artist, will introduce you to the different ways of working with paper. You will be drawing, designing and composing for paper cutting to create a beautiful landscape image. Discover the Museum collection of beautiful carpet designs ranging from the 1800’s to contemporary designers. You will be able to view the original designs and find out about the history of carpet designs. Its Wool Week so come and join us and make a wooly sheep. You will learn how to make shapes , use needles and create a friendly sheep to take home and impress your friends. Learn to make kumihimo braids using the traditional marudai and bobbins and the more portable foam disc. Braids of differing sizes can be made in a variety of yarn and colours for jewellery, tassels and decorations. Get in the festive mood with Jenni Stuart Anderson, rag rug artist, who will show you how to make a beautiful festive rag rug wreath. Enjoy a day of hand stitching and reminiscing. Incorporate well-loved memories into an amazing unique heirloom of you handiwork from re-cycled fabrics. Procion dye is a cold water dye for colouring cotton fabrics, lace and threads. On this workshop you will be shown how to prepare the dyes, learn a few rules on colour along with techniques to create textures on your fabric producing unique pieces of cloth. Come and work with paper artist Vanessa Stone to make beautiful and delicate paper cut Christmas cards and paper bunting. Vanessa will teach you the main techniques of paper cutting so you will go home with a wonderful collection of beautiful hand made decorations ready for the festive period.